These are lists of Finnish Spitz breeders and other contacts in the UK who are members of the Finnish Spitz Society. As a result, they are expected to comply fully with the Society’s Rules and Code of Ethics. However, the list is provided for information purposes only and the Society cannot recommend a particular breeder or be held responsible for any issues that may arise between a purchaser and a breeder. The first list is of those Breeders who may breed a litter or litters in the future. The second list is of some kennels and contacts who have bred a litter or litters in the past but to the best of our knowledge they have no intention of breeding again in the future. The details are mainly given for the information of past puppy purchasers. 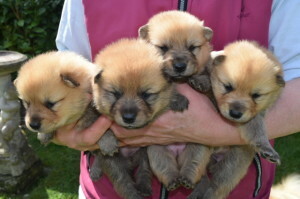 Please bear in mind that most of the people below will breed a litter of Finnish Spitz puppies infrequently. Only around 20 to 30 puppies are born in the UK each year, so at times there may be no puppies available. If you are unfamiliar with the breed, we strongly recommend that you arrange to visit an owner or breeder’s home to see them and their dogs and discuss things. Alternatively, one of the Society’s shows would be a good place to meet owners and breeders and to see their dogs. The final column shows where a breeder has a recently Born litter of puppies or has one Planned/Expected for the near future. Please contact the breeder directly.